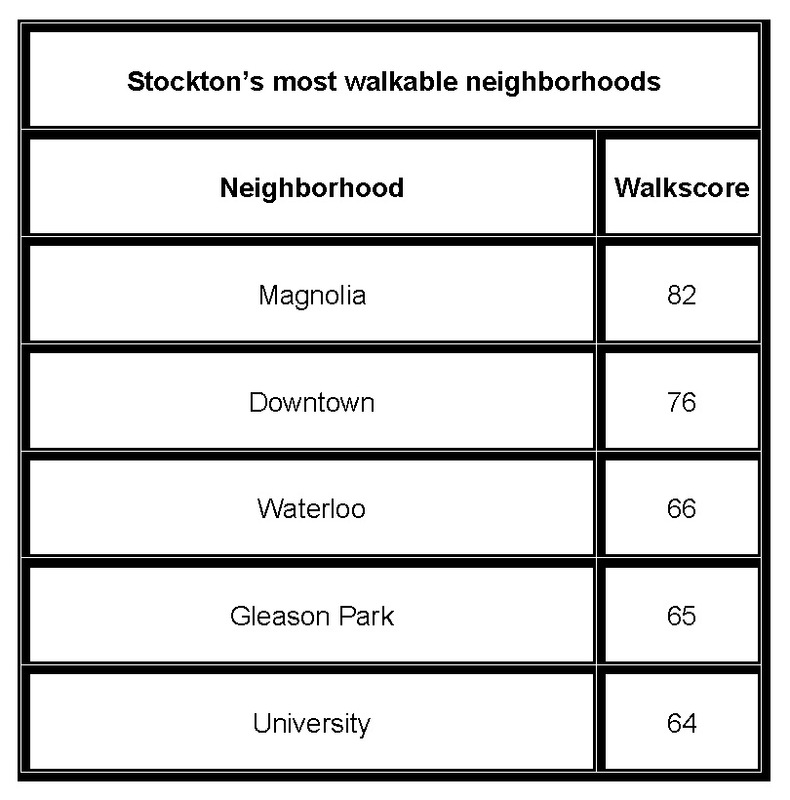 Walkscore—the popular website that calculates the walkability of an area based on access to amenities—recently released its 2014 data on walkable cities, and Stockton came out with mixed results. The bad news? 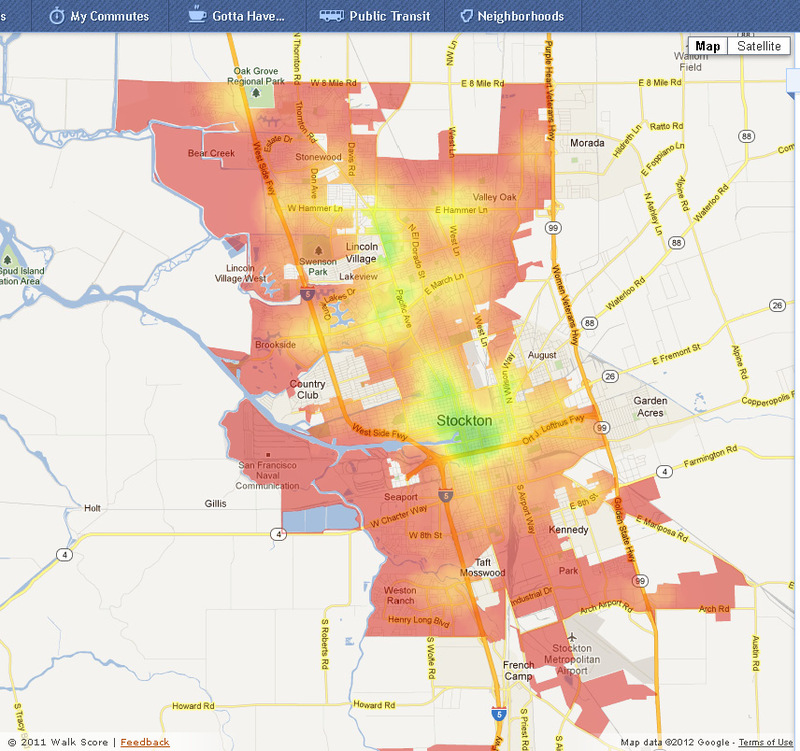 Stockton is not very walkable overall, and according to the site has actually become less walkable since last year. But on the bright side, Stockton’s core neighborhoods score well despite their underutilization, revealing their potential for revitalization into complete walkable neighborhoods. Overall, Walkscore gives Stockton a 40 out of 100, (down from 48 last year) placing the city as a whole squarely in the “Car Dependent” category. The score is unsurprising given Stockton’s pattern of development over the last 60 years. But compared to other cities, Stockton’s score isn’t too bad. Coming in at 41st overall among cities with a population of 250,000 or greater, Stockton is supposedly more walkable than Austin, San Antonio and Albuquerque, Kansas City and Indianapolis— Not necessarily the stiffest competition when it comes to good urban form, but still somewhat surprising. While it’s nice to be ranked higher than other cities, the most encouraging information is at the neighborhood level. While several areas are always going to be car dependent (e.g. Spanos East or Weston Ranch, both with a score of 11), Walkscore does show us where Stockton’s best hopes are for really great neighborhoods. This shouldn’t come as a surprise, but the areas with the most potential to increase Stockton’s Walkscore are in its core. Downtown has solid score of 76, even though there are not as many stores, shops and restaurants as there could be. Similarly, Magnolia and Midtown have strong scores—82 and 61, respectively– despite being generally neglected today and entirely ignored during Stockton’s building boom. While some portions of these areas suffer from blight and criminal activity, their walkable street grid layouts and proximity to commercial areas and downtown make them ideal areas for renewal. The characteristics exhibited by these older areas are the same as neighborhoods in other cities that have been transformed from troubled to desirable (e.g. 14th Street in Washington, DC, and Federal Hill in Baltimore). To some, these scores may seem nothing more than novel, but there are actually quite practical (and quantifiable) implications when it comes to a city’s walkability. In regards to housing, for example, a high Walkscore directly translates to higher housing prices. In a post last year, I explained that the higher the Walkscore, the more people are willing to pay for housing, even in Stockton. Walkability has become an important amenity to home buyers, and as a result many real estate agents will include Walkscores along with their property listings. Moreover, homes in walkable areas fared much better during the recession than their less walkable counterparts. Several studies have been conducted confirming the resiliency of property values in walkable areas against dips in the housing market. If the city wants to pump up property values and hedge against future housing bubbles, encouraging more development in older areas already designed for walkability would be a smart course of action. Walkscore is great, but it isn’t perfect. As I have highlighted in previous posts, the site does not take into account street-level conditions which greatly affect how far someone is actually willing to walk (e.g. street composition, building setbacks, parking lots, etc). The site’s algorithms also do not differentiate between big box stores that are almost universally accessed by car and smaller neighborhood stores that are supported by neighborhood residents. However, Walkscore gives us a good baseline. Using their scoring system, we can determine where Stockton’s next great neighborhoods should be located. ← What should this empty lot on Stockton’s waterfront be? I think an examination and analysis of what factors discourage walkability should be explored in order to identify and extrapolate what those hindrances are, and then subsequently propose solutions that will circumvent those factors and encourage and foster walkability as an enjoyable experience. One factor I can easily think of right off the bat is the lack of “public amenities”… in particular, sanitary public restrooms and their convenient availability. The public restroom is virtually extinct, or is in short supply, or is in the most frightening unusable state and needs to be condemned. Personally, I never venture downtown where I live (not Stockton) due to this public amenity absence. If you are not near establishments like restaurants and stores with restrooms (before closing hours), then there are few options when nature starts to call. Those over 50 do not venture out far or often on foot due to all sort of physical limitations, which include (dare I say) bladder and diarrhea issues. If there were strategically located and designated park-like corner mini lots or mini plazas, like resting points periodically placed along certain major “walkability routes”, featuring shaded seating to rest, a drinking fountain, good nighttime lighting, and a clean well lit public restroom that is periodically serviced and cleaned, then perhaps this would encourage walkability. I cannot tell you how on several occasions when I was out walking through the neighborhoods of residential homes and strayed to far away that on the way back I had to rush desperately to get to my home least I have a public embarrassment. It’s really not kosher to simply pound on a stranger’s front door and frantically beg them to use their toilet, though on one day that thought did cross my mind. There are several factors affecting walkability that Walkscore does not account for. For example, an area may be adjacent to amenities, but the state of the pedestrian experience deters walking very far. Take the Pavilions apartment complex off of I-5 in Spanos West. On paper, it is right across the street from dozens of businesses, but crossing a sea of parking lots is a big deterrent to walking. I would wager that many folks will actually drive the quarter mile to Park West Place stores rather than dodge cars crossing the street and through the parking lot. Steve Mouzon has put together criteria for walkability, it’s very good. Take a look. Even simple things like posting “NO RIGHT TURN ON RED LIGHT” at congested and busy intersections helps for the safety of the pedestrian and the handicapped.